Our activity for this week is.... a Snow Man! I dont have my entry today because I am working on the Tower model. I made one, but only spent just over half an hour on it (most of that time was spent making the head). [img]http://www.sp-mods.com/images/custom/models/snowman01.jpg[/img] is not a valid Image. 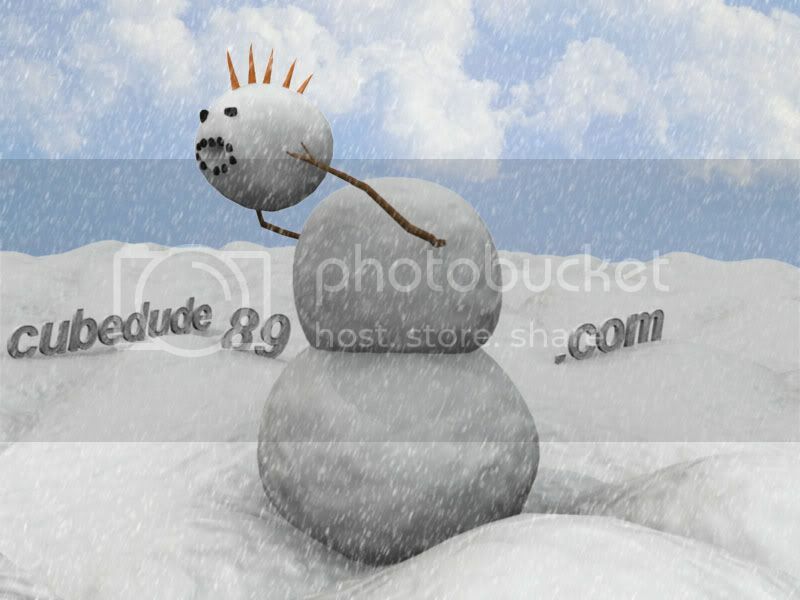 [img]http://www.sp-mods.com/images/custom/models/snowman02.jpg[/img] is not a valid Image. [img]http://www.sp-mods.com/images/custom/models/snowman03.jpg[/img] is not a valid Image. actually, when you export unrigged models it automatically adds a bone that has the animation data (which im pretty sure means if you exported that in compiled it, it would work in hl2) except for the fact that you did it in maya. Which then i cant guarantee it would work with or without a rig. I used more of an animation workflow rather then a game development workflow. I used maya, Started with the default sphere and used soft selection to give it a little difference. then copied that 2 more times and did some more tweaking with soft selection. Then I moved the head out and made the arms with a cylinder with some extra subdivisions. and moved the verticies around a bit. Then I mirrored the arm to the other side. Then I did the carrot hair the same way i did the arms. The eyes are made from cubes with a few subdivisions and a little tweak of the verticies then a smooth added to it. Then for the ground I used a plane with 20 subdivisions and did some soft selection with some various brush sizes. Then I duplicated it a lot and moved it around to make an open snow place. Then to add more detail I made a regular lambert shader with a bump map with a procedural cloud texture. I applyed that shader to the snowman and the ground. I had to play with the bump settings to get it to look right. The carrots were a simple orange color lambert shader. black lambert for the eyes and mouth. brown lambert for the arms. For the text I used maya's 3d text tool. I used arial font with a bevel preset. And I used some sort of shiny chrome type shader. I saved the render to .psd and brought that into photoshop. The render automatically creates an alpha channel so I could add a sky that i got from google. I tweaked a lot of settings of the sky picture to fit my render. Then the snow effect was made by making a white layer and adding noise filter (set to 150 and NOT monochromatic) Then scaled it up by 150% in both directions, Set layer to screen. then under adjustments i set the threshold to 240 then added a guassian blur (.5 pixel) then a motion blur. Yes you are supposed to explain so others can see your workflow to help them learn. My explanation probably showed you how much you still have to learn, right? I should make a video of it. Wouldn't it just be easier to make a High polygon version of the objects in the first place? plus you can use mudbox to sculpt even more detail in the high poly version before you transfer the maps.